Naypyitaw — A fully equipped Tatmadaw battalion believed to be dispatched to Maungdaw arrived at Sittwe Airport on Thursday morning, sources close to the Rakhine State government confirmed to The Irrawaddy. 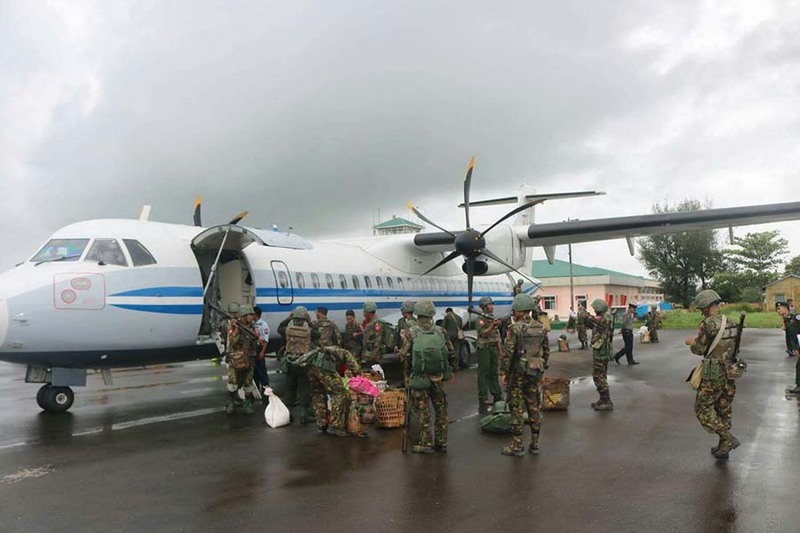 “At around 9 a.m. today, two military planes landed at Sittwe Airport. All of [the passengers] are soldiers. There may be around 100 in each plane. I heard they can’t proceed to Maungdaw because of bad weather and are staying in Sittwe,” a Sittwe local who was present at the airport told The Irrawaddy on the condition of anonymity. Sources close to the Rakhine State government told The Irrawaddy that they do not know the exact number of troops, but that they are meant to assist the security police force rather than directly engage in area clearance operations. The dispatch follows the Arakan National Party (ANP)’s request to the Tatmadaw commander-in-chief Snr-Gen Min Aung Hlaing to boost security in the area on Wednesday. “We’ve officially asked for further deployment of Tatmadaw forces for the security of Rakhine State. We pointed out that existing security forces are too small to protect ethnic villages. The army chief said the Tatmadaw has large forces and that he would increase the troops if necessary. And he did as he said today,” ANP lawmaker U Pe Than, representing Myebon Township in the Lower House, told The Irrawaddy. A senior military officer who asked for anonymity confirmed that the deployment was made at the request of ANP. However, he declined to give further details, citing security reasons. A spokesperson from the Rakhine State government said that the civil administration is not informed of military matters, and that he knew nothing more about what was reported regarding troop movements.